Following decades of economic exchange, Macau is now perfectly positioned to promote cooperation between China and Portuguese-speaking countries (PSCs). Macau’s historically close relations with PSCs, which began when Portuguese traders first settled there in the 1550s, is key to this unique position, alongside the fact that Portuguese is one of the official languages in the territory. In this respect, companies from PSCs are able to take full advantage of Macau’s privileged geographic position in the Pearl River Delta and its proximity to China’s biggest trade hub, the coastal province of Guangdong. The longstanding trust between the Chinese and the Portuguese makes Macau a melting pot that enables ever-closer trade relations between Beijing and PSCs. After centuries of alliance, mutual trust has been firmly consolidated, making Macau a unique place to exchange, understand and experience the difference in culture between China and PSCs. Naturally, it has also become the best stage for trade, investment and many other forms of cooperation too. Given Macau’s role as a bridge to China, numerous multinational companies are now holding their annual events in the area. The presence of representatives from PSC companies is always anticipated at such events. They are specifically designed to promote trade and business partnerships with Chinese companies, enabling foreign firms to take advantage of new opportunities in the country. One of the biggest events on the calendar, for example, is the Macao International Fair, at which there is a pavilion dedicated especially to companies from PSCs. Macau’s role is also enhanced by its participation in the Fund for Cooperation and Development between China and PSCs, as well as its recent launch of three strategic centres. The first is a business and trade service centre for SMEs in PSCs, the second is a distribution centre for goods, and the third is a new convention and exhibition centre that is focused on economic and trade cooperation between China, Macau and PSCs. Macau’s role as a gateway into China is complemented further by the many partnerships, strategic alliances and privileged contacts with local companies that it offers to entities from PSCs. After years of working together, various financial institutions and enterprises in Macau now have extensive networks in PSCs, while companies from PSCs have also set up offices and contact points in the territory in order to market their products to the mainland. 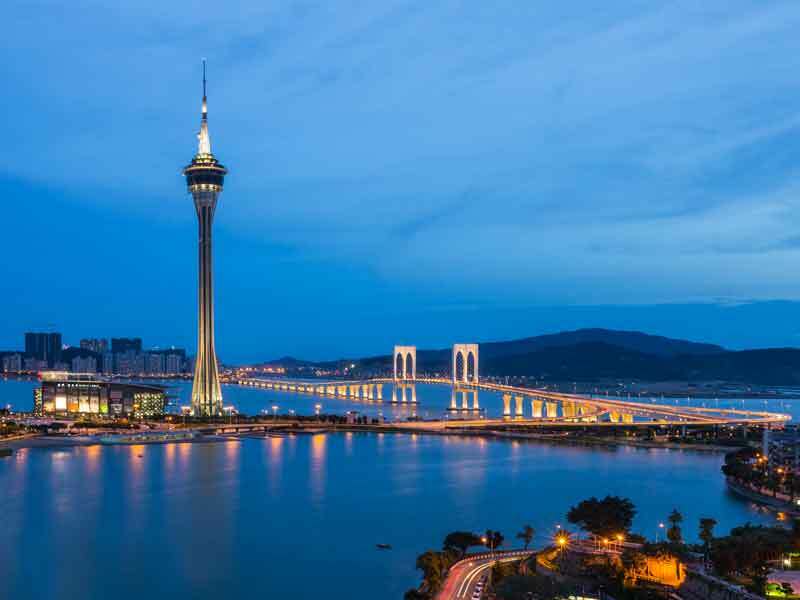 Macau’s business environment is itself a huge draw for many international companies, particularly given the territory’s impressive growth in recent years, together with its booming tourism industry. In addition, Macau has a simple taxation system in place, with corporate and individual tax rates never exceeding 12 percent – among the lowest rates in the region. And, like Hong Kong, Macau is a free port. It is also worth noting that the local government has no financial debt; indeed, year after year it has increased its surplus. In line with this growing economic prowess, two key infrastructure projects have recently been undertaken in Macau: the Taipa ferry terminal was opened in June, while the Hong Kong-Zhuhai-Macau Bridge is now approaching completion. There are now other large infrastructure projects on the cards too, including a light railway system. Another draw for foreign companies is Macau’s worldwide reputation. For example, Macau is recognised by the World Trade Organisation as having an “open economy that maintains few trade and investment restrictions”. What’s more, according to the 2017 Index of Economic Freedom, which was jointly released by the Heritage Foundation and The Wall Street Journal, Macau was ranked the 32nd-freest economy of 178 countries worldwide. The city also ranked ninth in the Asia-Pacific region. Its presence in Macau and mainland China, with a representative office in Shanghai and a branch in Hengqin, places BNU in a unique position to support PSC companies that have goals to enter the Chinese market. The bank can also assist Chinese investors with interests in PSCs by providing integrated financial solutions. In this regard, BNU has been extremely active in promoting trade and investment between China and PSCs. For example, the bank actively supports the initiatives of the Monetary Authority of Macao, the Macao Trade and Investment Promotion Institute, and AICEP Portugal Global, along with those of other official agencies. BNU also plays a crucial role in supporting new companies from PSCs in the territory, whether this is through facilitating communication or by providing financial services, particularly in terms of trade finance. Clearly, the bulk of trade and investment relations with PSCs occur through mainland China. Therefore, with the recent opening of a BNU branch in Hengqin to complement the office in Shanghai, BNU will play an even more active role in promoting business between China, Macau and these countries. In equal measure, our objective is to assist Macau investors and companies in expanding their businesses into mainland China, and to promote ever-closer cooperation between Macau and Guangdong Province. As the first international financial group to enter the Hengqin Free Trade Zone, BNU is very confident about the future of Hengqin within the overall development of the Pearl River Delta Region, and its mission to bring together entrepreneurs from both east and west. This, in fact, is the core component of Macau’s ambitious five-year plan. President Xi Jinping’s Belt and Road initiative will enable all countries that contribute to benefit from the rebuilding of ancient trade routes that connect China, Central Asia and Europe. This is a unique opportunity for the entire region, given that it comprises 4.4 billion people, constituting 63 percent of the global population, and has a combined GDP of $21trn. To achieve this ambitious goal, Beijing has already signed memorandums of understanding for the joint development of the initiative with several countries. That said, the initiative is more than the construction of roads, railways and ports. China’s vision is to form an infrastructure network connecting all regions in Asia, and between Asia, Europe and Africa, including energy and communications infrastructure, as well as transportation. Along this vein, CGD is also committed to Macau’s role as a renminbi clearing centre. The internationalisation of the renminbi brings forth numerous opportunities, not only by attracting the attention of the mainland business community, but also that of global financial markets. The rise of the renminbi reflects the growing economic importance of China and the increase in Chinese exports. As the second-largest economy in the world, China is now pursuing a greater role for its currency in global trade. With the inclusion of the renminbi in the IMF’s basket of Special Drawing Rights, and being one of the currencies with the highest growth in global transactions, the renminbi is now one of the main currencies used in trade between PSCs and China. As evidence of CGD’s commitment to the internationalisation of the renminbi, the group offers a full range of renminbi-denominated financial services to its international network. The results of Macau becoming a renminbi clearing platform between China and PSCs have also been encouraging, and will certainly have an even greater impact in the years to come. With the recent move of the headquarters of the China-PSC Cooperation and Development Fund to Macau, a new impetus has been given to the projects currently in progress, which in turn is generating renewed interest from around the globe. With a wide presence in various markets that are at different stages of development, CGD is deeply supportive of all these important initiatives. As such, the group is now establishing itself as a strong partner that can leverage the opportunities derived from the Belt and Road initiative and renminbi growth in order to further boost cooperation between China and PSCs.